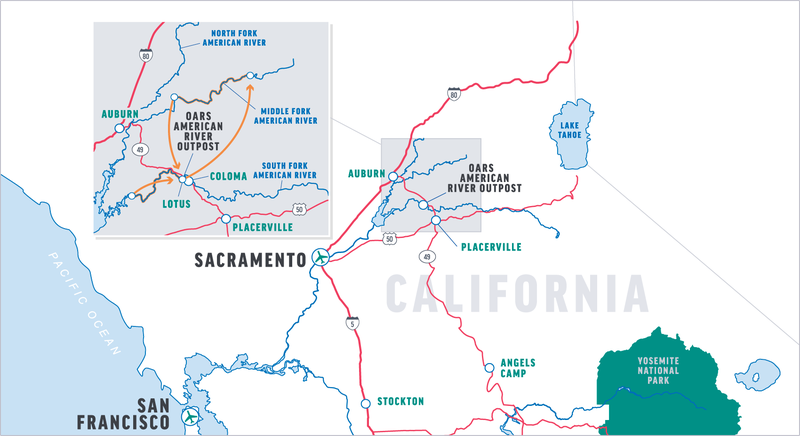 This adventure combines two of California’s classic whitewater runs: the South Fork and the Middle Fork of the American River. The South Fork includes rapids which are challenging, yet not extreme. There is plenty of time to indulge in family or group bonding, playful joke telling, and spirited water fighting. The Class III South Fork is a great warm up for tackling the rapids on the even more exciting Class IV+ Middle Fork the following day! Enjoy an evening of catered camping in between your days of rafting at the OARS American River Outpost. Our riverside-camp features hot showers and flush toilets. Bring your own camping gear or rent ours and relax in one of our great campsites. If sleeping on the ground just isn’t your style, you might be interested in our pre-set platform tents, which are fully equipped to make your camping excursion both comfortable and relaxing. What a combo; what an adventure! The South Fork and Middle Fork’s Class III-IV+ rapids are the perfect 1-2 combination! Water levels sufficient for rafting on the two forks during the summer months are a result of releases from hydroelectric facilities located upstream. Such water releases are not subject to the control of El Dorado County or commercial rafting companies. 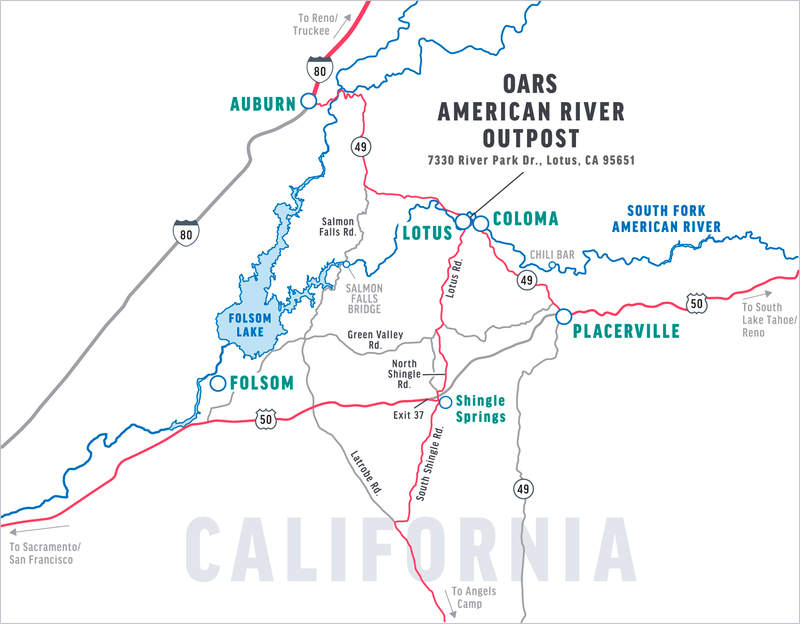 You will meet your trip leader near our camp store at the OARS American River Outpost at 10:30 AM or 11:00 AM. Roads around here are winding, so please be sure to allow for plenty of travel time. Our river-side campground and base of operations is in the heart of the twin towns of Lotus and Coloma. Our peaceful hideaway is surrounded by plenty of history, recreational opportunities and cultural activities. After you check in with your trip leader, your guides will deliver an orientation and safety talk and fit you with your safety gear. Several miles of Class II rapids on the South Fork allow you to warm up and enjoy plenty of swimming opportunities before entering the ever-exciting “Gorge” later in the day. After we reach our take-out at the Salmon Falls Bridge, we will return to our campsite. You are welcome to take a swim or a hot shower, join a game of horseshoes, or sit back and relax with a beverage as your guides prepare dinner. A delicious dinner is served between 6:00 and 7:00 PM; it might be anything from barbecued steak to Dutch oven lasagna. Tasty deserts always follow. The next morning, we will enjoy a cold “boatman’s breakfast”, which includes hot coffee, before our shuttle ride to the put-in on the Middle Fork. Our adventure includes the famous Tunnel Chute rapid, a growling stretch of whitewater which thunders through a man-made underground tunnel. (Some guests and groups of guests may be asked by the guides to walk around Tunnel Chute.) Afterwards, we will enjoy another riverside picnic lunch. Other exciting Class IV rapids include Cathedral and Kanaka Falls. Near the end of our journey, we will scramble around the 30-foot waterfall known as Ruck-A-Chucky Falls. As we reach our take-out point, an OARS shuttle will be waiting to give us a ride back to the OARS American River Outpost. Stay with us as long as you’d like before saying goodbye to your guides and our beautiful spot along the South Fork of the American River. There are several professional companies taking photos of each raft at some of the South Fork and Middle Fork’s larger rapids, which provide great action shots. These companies are not affiliated with OARS so you will need to contact them separately to purchase these pictures. Hotshot Imaging is conveniently based in Lotus right next door to our campground; visit them after your trip at their storefront on Hwy 49 to order pictures. (Photos for the South Fork trips are available for purchase online if you request the photo link for your trip from Hotshot Imaging. Middle Fork photos are available for purchase online without requesting the link.) For more information, visit www.hotshotimaging.com or call (530) 621-0400. We advise that you leave your valuables at home or in your private vehicle and take on the river only what’s absolutely necessary. We recommend you leave dry shoes and clothing in your car to ensure a comfortable drive home.